In countries where corruption is pervasive even at the highest levels of political and bureaucratic leadership, is it nonetheless possible to deter impunity? The dilemma, which I explored in a recent blog post, is that in many difficult governance environments the logic of power is centered around personalized deal-making. A culture of deal-making can all too easily degenerate into extremes of impunity, with profoundly corrosive effects on a country’s institutions – but where such deal-making has become central to the political culture stamping out corruption hardly seems plausible. In such settings, might it nonetheless be possible to establish a credible tripwire capable of deterring the worst abuses? A remarkable example from Indonesia, explored in two papers written this past fall by graduate students of mine at Johns Hopkins University’s School of Advanced International Studies, suggests that that given the right combination of circumstances and creative activism the answer can be ‘yes’. Indonesia certainly fits the bill of a difficult governance environment. Estimates of the amount of wealth amassed by the family of President Suharto during his 33-year reign (from 1965 to 1998) range from $15 billion to $73 billion. In 2004, Transparency International named him the most corrupt leader of the previous twenty years. Though things have improved since then, over the past decade the Worldwide Governance Indicators consistently locate Indonesia in the bottom third of countries globally in control of corruption. The KPK indeed appears to be a tripwire against impunity. The fish caught were ‘big’ Among those it successfully prosecuted and convicted between 2008 and 2013 were: 72 members of parliament; a close family member of the sitting president; senior officials of the ruling party; the chief of one of the state-owned oil companies; the religious affairs minister; the chief justice of the constitutional court; and (perhaps most popular of all among citizen tired of being harassed on an almost daily basis) the commander of the National police traffic division. Further, contrary to the experience of anti-corruption drives in other countries, there has been no sign of any systematic targeting of political enemies while turning a blind eye to friends. Very broad investigative and prosecutorial powers that allowed the KPK to circumvent and overrule police and prosecutors. These powers included the right to tap phones without a court order, to impose travel bans, to freeze bank accounts, and to access financial records. A very robust screening process before a case is brought to trial – but a requirement that once the KPK officially names a person as a suspect, it is required to reach the trial stage (a fail-safe arrangement to prevent prosecutors from dropping a case in exchange for a bribe). A wholly independent anti-corruption court to hear the trial — comprising five panelists, including three ad hoc appointees, drawn from eminent lawyers, legal scholars or retired judges. A deeper explanation for the KPK’s success is to be found in a happy combination of context and development entrepreneurship. As my SAIS student Chris Crow detailed in his paper on Indonesia’s democratic transition, the Indonesian environment in the latter 1990s offered a classic ‘window of opportunity’ for reform. (The law establishing the KPK was promulgated in 1999.) Suharto was forced from power in May, 1998. His handpicked successor, BJ Habibie, with virtually no independent power base of his own, tried to win legitimacy by turning to reformist segments of Indonesian society. Ryaas Rasyid, a young academic who had written his dissertation on democratic reform, was perfectly positioned for this moment. He had been appointed in the last years of Suharto’s rule to lead a task force of seven political scientists to scope out a plan for political reform. In latter 1998, in an effort to strengthen his legitimacy, Habibie turned to this group to draft a new set of electoral laws. ‘Team 7’, in turn, capitalized on their newly-won status as successful refomers to advocate successfully for far-reaching decentralization of the political system. 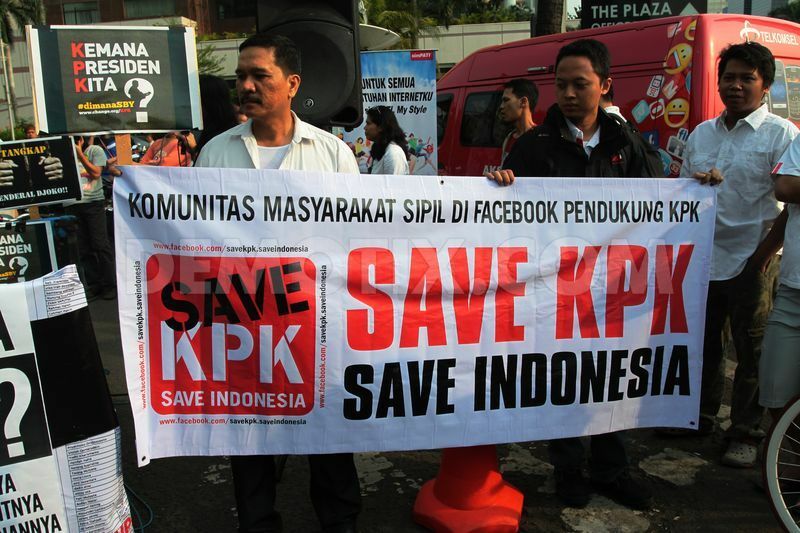 Among democracy advocates, at a difficult time globally, Indonesia is coming to be seen as a beacon of hope. Part of this sense of hope comes from the message sent by the KPK’s successes – that powerful leaders act with impunity at their peril. To be sure, the country falls far, far short of anyone’s depiction of “good governance”. But what stands out (and the KPK exemplifies) is the sustained, determined focus of reformers both inside government and in civil society on achievable objectives, rather than on rhetorical flourishes — on a development strategy organized around what I describe in my recent book, Working with the Grain as “islands of effectiveness”. “Hope”, I suggested in Working with the Grain, “can come in different intonations. There is the drumbeat of exhortation, of a world on the march to some more perfect destination on the horizon. But hope can also come in a quieter pitch: searching – encouraging deliberation, reflection, co-operation.” In its steady, incremental, cumulative progress, the KPK is an example of this latter kind of hope – as an important beacon pointing towards what is possible, even in difficult governance environments. I’ve been puzzling (yet again!) over the usefulness of anti-corruption as an entry point for engagement by civil society, donors and other developmental champions. Always and everywhere, behaving ethically is surely crucial to meet the most important test of all — the “look oneself in the mirror every morning” test. The question for activists is not whether we should model ethical behavior — an obvious “yes” — but what are the pros and cons of an anti-corruption ‘framing’. I list below three analytically strong arguments against using anti-corruption as an entry point– but also one compelling argument for its use. It would be terrific if this post could get some fresh new conversation underway on the dilemma. Here (to establish that I’m not coming at this as an apologist) is the argument ‘for’ focusing on anti-corruption. Impunity is corrosive. It can over time destroy a country’s entire development platform. In the absence of sustained vigilance, some political leaders might find themselves wading, step by incremental step, deeper and deeper into the mire of corruption – setting a tone at the top which progressively pervades layer after layer of a country’s institutions. The absence of a strong anti-corruption voice in society can help ‘enable’ this type of downward slide. A few years ago, I began asking colleagues within the development community how one might tell the difference between those political and bureaucratic leaders who were doing what was necessary to achieve developmental goals in settings where formal institutions were weak – and those who had crossed over to the ‘dark side’ of impunity and predation. It took many months before I finally came across a colleague who (based on his many years of experience in an African country which had experienced both types of leadership) provided a compelling answer. “It’s easy”, he said. “In the former case, the informal rules of the game are clear, and the leaders play by them. In the latter, the rules are not clear – and, whatever, they might be, they do not apply to the leaders themselves”. Compelling, yes – but how can activists translate the above into a strategy which provides a ‘tripwire’ in the face of impunity but, at the same time, sustains a positive discourse for the development endeavor as a whole? Reflections appreciated – and more on this in subsequent posts….